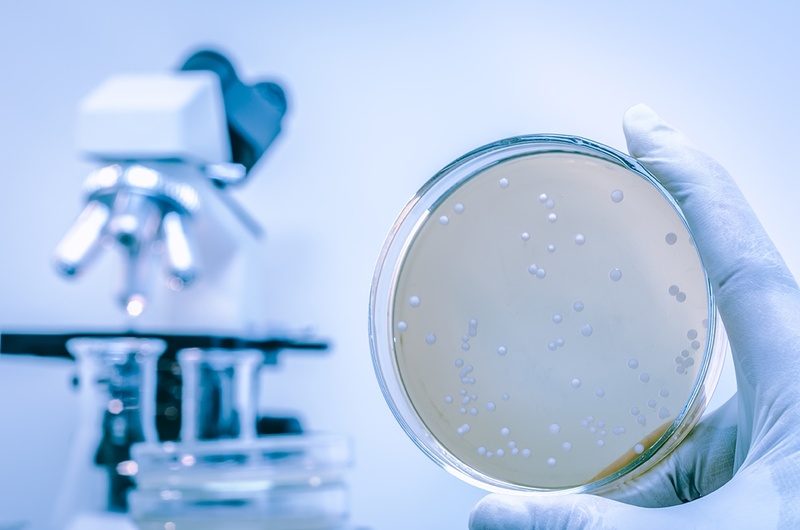 In this blog post, I will demonstrate that the Cellulose fibrils suspensions, when handled as recommended, compared to Xanthan Gum supplied as a powder, are robust and stable against immediate microbial degradation. How robust against degradation is a non-preserved suspension of Cellulose fibrils, compared to that of a non-preserved Xanthan Gum suspension? Both materials are biodegradable and from natural origin. They are both shear thinning and have very good stabilizing properties. The major difference between these two materials is that Cellulose fibrils is a non-soluble fibril network, whereas Xanthan Gum is a soluble polymer. The chemical and microbial stability of the non-soluble fibrils is known to be considerably higher. Read more about The biological degradation of Cellulose. In order to visually demonstrate the stability of Cellulose fibrils against microorganisms, a suspension of Cellulose fibrils is compared to that of Xanthan Gum at a similar concentration, under similar conditions and over time. 1 wt% suspension of Cellulose fibrils and 1 wt% solution of Xanthan Gum were prepared and stored at room temperature (~20 °C) over 1 months without adding preservative. 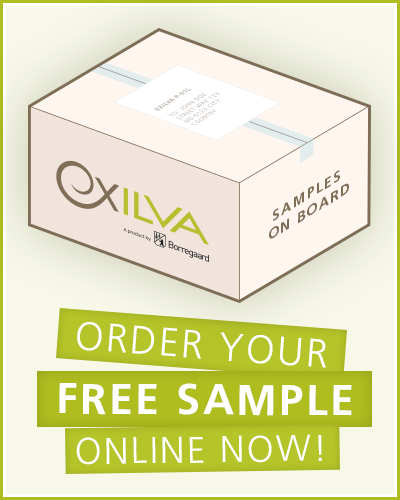 Samples were handled in a similar way, avoiding contamination during the preparation step. The resulting Cellulose fibrils suspension (Exilva from Borregaard) is opaque while the Xanthan Gum solution is transparent. 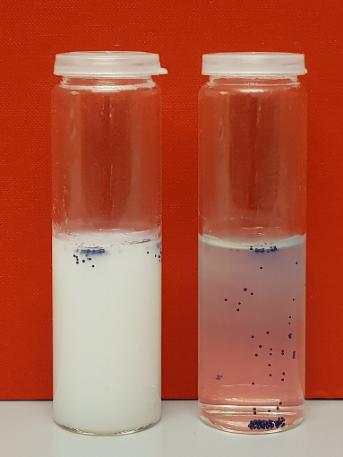 In order to visually assess the performance of the two suspensions, synthetic microbeads were added to the top of the suspensions. In both cases, at the start of the experiment, due to the high yield stress and stabilizing properties of the materials, the beads were suspended on the top of the container. opaque layer to the Xanthan Gum suspension (to the right). After 1 week, a top opaque layer was formed in the Xanthan Gum suspension. Nothing was noticed in the Cellulose fibril suspension. The beads in both cases were suspended on the top. 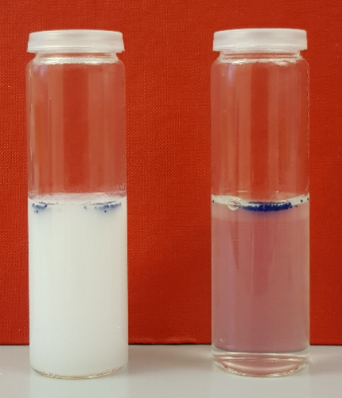 Figure 2: One month into the trial, the opaque layer in the Xanthan Gum suspension (to the right) had increased in thickness. Still no visible change in the Cellulose fibrils suspension (to the left). After 1 months, it was noticed that the top opaque layer in the Xanthan Gum suspension increased in thickness and most of the suspension became opaque. Nothing was noticed in the Cellulose fibrils suspension. It was noticed, in the case of the Xanthan Gum suspension, that most of the beads had sunk to the bottom of the container. In the case of the Cellulose fibrils suspension, the beads remained on the top as seen from the picture. This study demonstrates the excellent stability of cellulose fibrils. They do not easily decompose or degrade due to microorganism contamination in such a short time as can be seen in the case of Xanthan Gum. Cellulose fibrils are suspended and not dissolved, making them more robust and resistant to degradation. Cellulose fibrils are robust against degradation. When stored as recommended and without intentional contamination, the performance as well as the appearance and the smell of the material remains unchanged over time (for at least 12 months). However, in case the Cellulose fibrils are intentionally contaminated, the appearance and smell of the material might change while the performance will most likely not be affected.